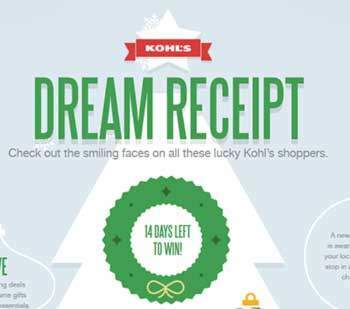 www.kohls.com – Kohl’s Dream Receipts Sweepstakes. Kohl’s Department Stores, Inc. is Sponsoring this new marketing promotion: “Kohl’s Dream Receipts Sweepstakes” where you could win cash prize up to a maximum of $5,000. depending on your purchases (kohls.com/dreamreceipt). Up to a maximum of $5,000.00. If winner entered via price inquiry at Store. kohls Dream Visit a participating Kohl’s Department Store during the Promotion Period or shop online at www.kohls.com maybe on Monday for Kohl’s Cyber Monday deals and Navigate the internet to www.kohls.com and make a purchase of any amount (excluding purchases of gift cards and Kohl’s Cares® cause merchandise) during the Promotion Period. 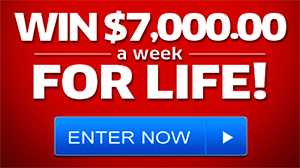 Imagine winning the amount of your purchases or more or starting the new year with some extra cash. Good luck! The Kohl’s Dream Receipts Sweepstakes (“Sweepstakes” or “Promotion”) is open only to legal residents of the 50 U.S., including DC, 18 years of age or older. Note that The Promotion consists of (1) an In-Store “Spotter” Game and (2) an Online Sweepstakes. And qualifying purchases made at Store point-of-sale/cash register, up to a maximum of $5,000. this marketing sweepstakes promotion ends on the day before Christmas that is to say December 24, 2013. Visit www.kohls.com sweepstakes section to get more information and prize details about Kohl’s Department Stores. See official rules also. Good luck and Happy Holidays. Win a Dream Receipt The Kohl’s Dream Receipts Sweepstakes. Good Luck!